Students gather around Sean Sweeney to learn how gemstones are cut. May is going to be a wonderful month in the state of Maine and I will be directly involved. The new Maine Mineral and Gem Museum in Bethel, Maine is open for business and is much anticipated must-visit site in this great Gem State. With Dr. Carl Francis as curator and a wonderful staff running a research lab under the direction of Dr. Skip Simmons, formerly of the University of New Orleans, the Museum is already making its mark. I have not been there yet so I’ll visit as part of a three-stage adventure in Maine during the month of May. After all, Maine’s pegmatite gem mines are world famous. We featured these gem mines a few years ago when we visited Mount Mica, Maine as part of the video “Gemstones of America,” which included mines in Maine, California, Oregon, Arizona, and Montana. 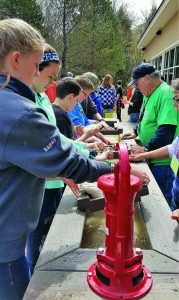 On Friday education Day students learn sluicing and other mineral collecting activities. I’m going to combine a visit to the Maine Mineral and Gem Museum in Bethel with a very special three day weekend at Maine’s Grand Summit Lodge and Convention Center where the New England Mineral Association (NEMA) will be holding the seventh annual New England Mineral Conference May 10-12. Couple these two superb mineral activities with a chance to participate in a conference-related field trip on Sunday, May 12 and you have a perfect vacation trifecta! In the On the Rocks column of a future issue, I’ll share details of this very special Maine mineral trip. The New England Mineral Conference is always well attended. The lectures are exceptional and feature the latest mineral news and activities. Since Maine is famous for its gem pegmatite deposits it’s only fitting that one speaker will be Frank Perham, who is known for digging the Smithsonian’s Green Giant watermelon tourmaline. Frank is a member of the noteworthy Perham family that has been involved with Maine gem mining seemingly forever. The latest news on pegmatite mining in the Pala District, California will also be offered by Jeff Swanger. New England, especially Maine is famous for its superb fluorapatite, so the specimens in the Harvard collection will be described by Kevin Caja. I’ll also be speaking at the convention, and as of this writing the subject of my talk has yet to be decided. I may simply tell what it was like to collect in New England about 70 years ago right after World War II. For New England collectors those were the halcyon years. The Saturday lectures are just one important part of the three-day mineral education event that also include field trips, student activities and all sorts of mineral-related events including a specially arranged visit to the new museum. The free time we will have during the three days can be spent visiting mineral dealers who are set up at the hotel as part of the weekend conference. 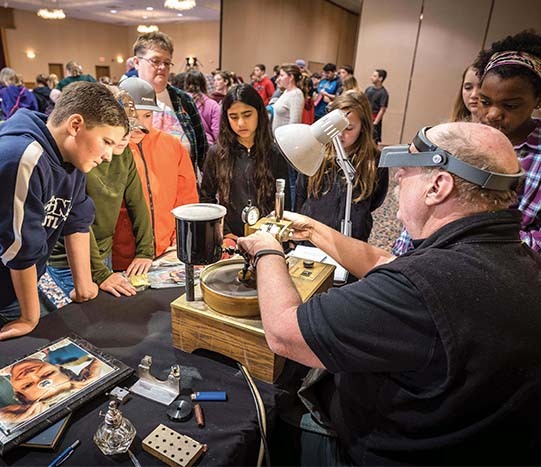 This excellent event has become an important mineral weekend in the Northeast and is attended by over 300 dedicated folks including collectors, scientists, miners, and eager students. In fact, when I inquired of Jeff and Jan Morrison who head up the conference to get information about the 2019 May event they threw me an interesting curve by inviting me to be one of the speakers. Everyone knows I “have lecture will travel” mindset so it only took me seconds to accept. Readers who know me also know I happen to be one of those science types who would start packing if you said I could go to the moon tomorrow! What could be better than a chance to attend the New England Mineral Conference, visit the new Maine Mineral Museum in Bethel and maybe swing a hammer on a pegmatite mine dump, during the conference’s Sunday activity? Collecting during the May conference will not be my first experience collecting in Maine. As a school teacher in Arizona, I had my summers free. Summer in Arizona at 110 degrees was not my idea of good collecting weather. So, for over 20 years my family and I spent summers on my dad’s farm in Connecticut where I had grown up and went to college. Before moving to Arizona I spent nearly 30 years collecting in New England and when I did my master’s thesis I collected at and included data on over 70 Connecticut mineral localities. My summers in Connecticut and my writing for a mineral magazine helped me meet a lot of good collector folks in New England. 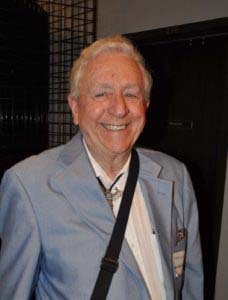 One fellow, in particular, Al Cebula, of Manchester New Hampshire, epitomized the Eastern folks with whom I collected. The Conference crowd listening intently to a lecture at the 2018 NEMA event. textbooks so he could pursue his hobby. He was physically strong and a very intense collector who worked hour after hour to make every dig productive. Interestingly, Al was also a successful wrestler in his youth. He was so good he showed me his letter from Avery Brundage of the International Olympic Committee who invited him to join the U.S. Olympic team going to Germany in the 1930s. He had little money so couldn’t make the trip. To show me how strong he was he would hang upside down by his ankles from an overhead beam and do up-side-down sit-ups at age 78. To give you a prime example of his research and hard work he re-discovered an old Dana textbook locality, from “The System of Mineralogy of James Dwight Dana and Edward Salisbury Dana,” in New Hampshire that Dana had described. The locality had produced a mineral called iolite. You won’t find that mineral name in today’s textbooks as it is now called cordierite. But in Dana’s day, it was iolite and was reported to be found in Richmond, New Hampshire. In the decades that followed Dana’s report, the locality was forgotten and nobody could tell Al where it was. Al did his homework and eventually tracked down some old New Hampshire literature that led him to the deposit. He worked it time and time again and found some remarkable blocky iolite crystals to several inches long encased in quartz. What is interesting about his find is the original iolite crystals he dug had altered and were identified by university types as pinite after cordierite, another name you won’t find in the literature. I hope some New England old-timers remember Al Cebula. He was a real rockhound treasure. Al and I spent many an hour on Moat and other New Hampshire mountains digging topaz, smokes, and quartz. We even ventured into Maine for vesuvianite. But my biggest adventure into Maine was when I joined the television crew shooting “Gemstones of America” on Mount Mica. The New England Mineral Conference May 10-12 is crammed with mineral activities. Each conference actually has its beginnings at the end of the previous year’s conference when school children are invited to enter a yearlong mineral-mining poster contest that starts immediately and lasts all year culminating at the following year’s conference with the awarding of prizes. Students have a year to do research and design their posters that are judged by grade-level and exhibited at the next conference. This is serious business because awards are given at grade-appropriate levels and are substantial: a one week at geology camp, a rock collecting kit for a day long digging adventures at local mines. As a retired teacher, I’m particularly anxious to see the Friday education day activities because students will be given a chance to go through some 20 different learning stations devoted to minerals. Manned by about 90 local volunteers rockhounds and teachers the educational stations include mineral sluicing, rock hammer work, gold panning, learning how to identify minerals, gem cutting, learning about fossils, micro-mounting, using a microscope, the rock cycle and there is even a station about blasting. That is something I have to see from a distance. Friday will culminate with a visit to the new Maine Mineral and Gem Museum in Bethel. 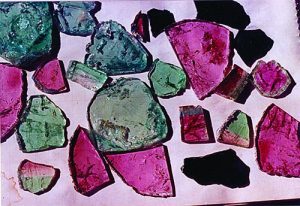 I’m excited about this visit because from what I hear the new exhibits are excellent and Maine’s most famous mineral, watermelon tourmaline, will be featured in an exhibit and as beautifully fashioned jewelry. Saturday is a full day of mineral lectures featuring four to six lectures depending on subjects and time. Speakers include professionals and amateur collectors as well as miners who will share recent findings and recent mining activities along with the latest research and mineral discoveries. Sunday is field trip day. Attendees have a choice of two or three different mines you can visit and try your luck. There is a small fee connected to these field trips. We haven’t said much about mineral dealers at the conference. They set up at the Sunday River Hotel and will be there in full force. Like most symposia and conferences I’ve attended the dealer rooms will be open at times when there is no conference activity. That suggests evenings will be great social fun.